Although this next bit of info isn't technically frugal, it may save you some money by wasting less. "Sell by" date: This tells the store how long to display the product for sale. You should buy the product before the date expires. This is basically a guide for the retailer, so the store knows when to pull the item. This is not mandatory, so reach in back and get the freshest. The "sell by" date is the last day the item is at its highest level of quality, but it will still be edible for some time after. "Born on" date: This is the date of manufacture that has been resurrected recently to date beer and soda pop. These drinks can go bad after three months. "Guaranteed fresh" date: This usually refers to bakery items. They will still be edible after the date, but will not be at peak freshness. "Use by" date: This is the last date recommended for the use of the product while at peak quality. The manufacturer of the product has determined this date. "Pack" date: You will find this one on canned or packaged goods, as a rule, but it's tricky. In fact, it may be in code. You may find it best to call the manufacturer for how good it is. 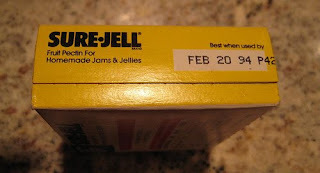 Inquiring minds want to know...do you really have a box of Sure-Jell that expired almost 15 years ago??? No I don't have a 15 year old box of Jello. However, if you click on the picture you will find out the story behind the picture.